In 1930s literary London, ballet was everywhere. Virginia Woolf, several Stracheys, the Bells, E. M. Forster, H. G. Wells, John Middleton Murry and Katherine Mansfield, Aldous Huxley, the Sitwells and T. S. Eliot all attended the Ballets Russes. Louis MacNeice’s Les Sylphides appeared in 1939, and in the same year Henry Green’s Party Going used the same ballet as a structural underpinning. It wasn’t just the intelligentsia, either. Compton Mackenzie wrote two novels with a dance protagonist, and even Eric Ambler’s Cause for Alarm (1938) contained a reference to Diaghilev. A few dance writers have attempted to bridge the gap, but almost no literary specialists. Now Susan Jones, a Conrad scholar as well as, before that, a dancer, is ideally placed to take the subject forward, as one who can see how, “At the still point of the turning world . . . there the dance is”. For the relationship between dance and literature is not merely “one of the most striking but understudied features of modernism”, but one of reciprocity: dance drew on modern literature as much as modern literature was shaped by dance. Until now, literary theorists seem almost deliberately to have turned away from movement and its presence in their subject. In Conrad’s Heart of Darkness, there is a famous scene generally referred to by scholars as “the image of the African woman”, even though Marlow is plainly describing movement, not a static “image”, a woman “treading the earth proudly” until “she stopped . . . . Suddenly she opened her bared arms and threw them up rigid above her head, as though in an uncontrollable desire to touch the sky . . . . She turned away slowly, walked on, following the bank, and passed into the bushes to the left”. Everything in that moment is about movement, even as its acquired tag reduces it to a tableau. Similarly, Gilles Deleuze wrote absorbingly on Samuel Beckett’s three languages, languages of names, voices and images, but despite Beckett’s fanatical care for stage directions, Deleuze never appears to have contemplated the author’s language of movement. Yet Beckett’s knowledge of dance was formidable, and formidably integrated in his work, which drew on Eurhythmics, music hall, ballet and commedia dell’arte. In a more populist vein, Sjeng Scheijen’s acclaimed biography of Diaghilev (2010) referred to the designer, librettist and composer of Parade as its “three creators” with, apparently an afterthought, “Massine as choreographer”. It is not Scheijen’s blind spot that so intrigues: it is that so few – or no? – reviewers even noticed the blind spot. Oversight is the norm for dance. Jones locates the origins of the modernist nexus of dance and literature in the nineteenth century, with the performances of the only now critically reassessed Loïe Fuller, and with Stéphane Mallarmé and Nietzsche’s writings. Fuller was an innovator, creating mesmeric effects through swirling steps and long silks which were manipulated with her body and with hidden sticks, highlighted by new techniques of lighting. Only a year after her first dance performance in 1892, Mallarmé was already describing her art as a model for literature, both dance and symbolist poetry using compressed forms of expression, with Fuller’s “écriture corporelle” permitting a “poetics of potentiality . . . a signifying practice that in its most abstract and ideal form dispenses with the generation of verbal meaning”, the dancer’s gestures creating an indeterminacy that allowed each viewer to create their own meaning. Three decades earlier, Mallarmé’s “new poetics” had concentrated on “not the thing itself, but the effect it produced”; now Fuller’s “bodily writing” gave the poet a way to become the poem. The struggle between the Apollonian and Dionysian might be said to have created twentieth-century dance, and literature. Modernism turned to the ancient, to ritual, to express itself, with its dichotomies of attraction and repulsion, of the individual and the community. One of the most compelling sections in Jones’s book is her analysis of Bronislava Nijinska’s Les Noces, recognized by the dance world as a masterpiece on a par with the “Demoiselles d’Avignon”, or Mrs Dalloway. It was, she demonstrates, a complement and response to Nijinska’s brother’s more famous (in reputation, although in reality lost) Sacre du Printemps. In both, a female is sacrificed to the greater community through ritual, and rhythm takes precedence over melody, dissonance over assonance. Both concentrate on symbolic forms, flattened, two-dimensional shapes, scenes rather than narrative, and primitive designs – in Nijinska’s case, constructivist art, in Nijinsky’s, Roerich’s quasi-pastoral primitivism. Both incorporate Mallarmé’s “poetic impersonality”: movement was “pure, self-contained”, not a conduit for dancers to express themselves. And in both the stylized choreography required the “active engagement on the part of the viewer to complete its meaning”. When movement stops, Nijinska wrote, “an illicit ‘intermission’ begins”, not a pause, “for a pause is also movement – a breath, as it were” – that is, Woolf’s “still space that lies about the heart of things”. This is only one small example of the many cross-fertilizations that Jones so ably explores. Her chapter on Eliot breaks new ground, whether it is the discussion of Petrushka and “The Hollow Men”, or Murder in the Cathedral and Antony Tudor’s Jardin aux lilas, the two pieces staged at the Mercury Theatre in tandem. Tudor’s poetic evocation by elision of “what might have been” displayed in moments of frozen gesture may well have influenced Eliot’s still points. Both men similarly returned to the past – Eliot to the Elizabethans, Tudor to the Edwardians – to create a new present. Her chapter on Beckett is equally enlightening. But it is these chapters that make other sections of the book so frustrating. Jones has chosen to structure her book chronologically around the development of modernist aesthetics as writing, and thus privileges literature over movement. Given that most of her readers will have a better grasp of the history of literature than of dance, this is unfortunate, as the book dashes ahistorically through the dance world wherever a literary strand takes her. It also forces her into many repetitions, some even word for word. Another, more uncomfortable reality is the ephemeral nature of dance. Jones devotes a long section to Andrée Howard’s The Sailor’s Return, another vanished work. A few of its scenes were filmed, and there is a programme synopsis. But that is all, and yet Jones discusses the piece as though it can be intimately studied: “Howard’s use of textual detail helped her express in dance the fine gradations of tone and register in the novel”. This may be so, but I would like to know how Jones knows. What modernism means, for dance, too, is a vexed question, and one that needs to be confronted directly. One of Jones’s definitions is that, as with modernist literature, narrative and character are treated in a non-linear, non-realist fashion. But as early as 1841, Act Two of Giselle was already reaching for the abstract, as was Act Three of La Bayadère in 1877, and Ivanov’s white act for Swan Lake in 1894. Jones discusses the changes to Balanchine’s Apollo from its inception in 1928, when it had a prologue narrating the birth pangs of Leto, and a set with a tumulus up which Apollo climbed to reach his apotheosis as “Musagète”, to the 1979 version which omitted both birth and tumulus. But to describe the loss of the climb, as she does, as a shift from the Dionysian (as demonstrated in the physical manifestation of the upward struggle) to the Apollonian (achieved) is to ignore a number of productions which to this day contain a set of stairs, up which Apollo and the muses continue to progress. That ultimately encapsulates the difficulty of dance scholarship. There is no one, definitive, Apollo, and thus its meaning, or even its style, is elusive. And this example can be multiplied endlessly. Jones sees the choreographer Léonide Massine as a stark modernist, which in his choice of collaborators he certainly was, working with assorted Cubists, Fauves, even Dalí, and among the first to use symphonic music for dance, “and yet”, she laments, “his impact on modernism in a wider field has been overlooked”. This might be, I would suggest, because his choreography was not modernist at all: working with modernists does not make you yourself modern. As Eliot harked back to the Elizabethans, so choreographers of real modernism – Fokine, Balanchine – frequently invoked the past, while old-fashioned choreographers like Massine, who resisted a deeper modernism, superficially embraced all the current tropes. As the historian Jennifer Homans has reminded us, dance, with its ephemerality of performance, is an art of memory, not history. Most of dance has vanished into the great unremembered. Where work has survived, and can be analysed – Les Noces, for example – Jones is a peerless guide, moving us back and forth between art forms with a dizzying virtuosity of her own. More generally, the great strength of Literature, Modernism, and Dance lies not in (the impossible) re-creation of the invisible, but in Jones’s exemplary account of how performances and performers endowed artists in other genres with ways to think about their process. Michael Cardew, one of the great studio potters of the 20th century, was a man of doubleness. He was born into the heart of upper-middle-class establishment Edwardian England – a great-grandfather had been Lord Chancellor, a grandfather the Dean of Winchester, and he was related to soldiers, lawyers and diplomats (and Kim Philby, as well as Montgomery of Alamein). His mother was one of Lewis Carroll’s favourite child-models, his father had known Oscar Wilde. Living in poverty, working at a craft rather than a profession – these were things that were a matter of pride: as much for what he had given up as for what he had gained. Similarly doubled, he married young and fathered three children, yet while never divorcing, his lifetime of emotional engagement was with a series of young men. His father had collected slip-decorated pottery made by Edwin Beer Fishley, a noted north Devon craftsman: slipware was, he believed, “warm and kind and generous”, and he learnt to throw from Fishley’s grandson. Even before he left Oxford, he had sought out Bernard Leach, who had just moved into his new home in St Ives. Leach couldn’t pay him, but his youth and enthusiasm won him a place in the new studio, where he met a series of not-yet famous names: Katharine Pleydell-Bouverie, Norah Braden, Shoji Hamada, and William Staite Murray. 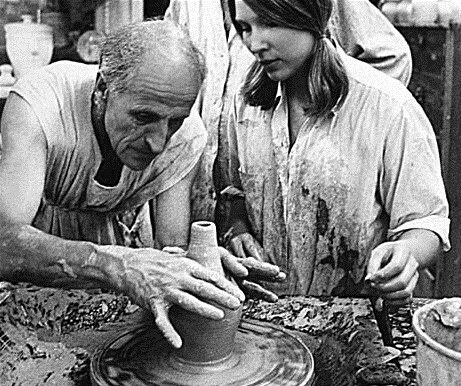 Studio pottery in the Twenties was a new movement with a spiritual element, one that Cardew embraced: the making was as important – more important – than the finished product. In 1926, Cardew established his own pottery, in Winchcombe, in Gloucestershire, where he hoped to put his beliefs into practice, creating works of culture as well as of skill, statements of belief as much as clay-based items. Yet here too he was doubleness personified: the idea of pottery for display rather than utility was anathema to him, and yet he was creating a very personal artistic vision. He was searching for the ordinary, even as he was forging a highly individualistic – and privileged – path. The individualism prodded him to leave the comfortable Cotswolds for a bleak site in north Cornwall, and then, in wartime, to the Gold Coast (now Ghana), and later to Nigeria. There too his doubleness was on display: as a colonial servant appalled by the ideas of empire that were being imposed on indigenous populations; as a teacher who, over a quarter of a century in West Africa, failed to establish functioning programmes or train protégés to a level that they would be able to forge their own careers. One problem was his adherence to the mystic over the practical. It was not until he reached his early fifties that he finally buckled down and studied ceramic technology. Later in life he wrote a magisterial summation of his career and beliefs, Pioneer Pottery, which won many admirers, and more than a handful of acolytes, who surrounded him in his new role of performer-magus, as he toured university campuses abroad, preaching his ideas of the intellectual’s pastoral life and demonstrating his throwing skills. Yet his “technological romanticism” demanded primitive living conditions, and an extreme level of deprivation for himself and his family and admirers: a failure to accept those living conditions was understood as a triple failure: of intelligence, of will, and of artistry. Tanya Harrod, with an encyclopedic knowledge of craft, has spent a decade immersed in her subject’s life, and her command is obvious. Quiet, gentle and elegantly written, The Last Sane Man nevertheless pulls no punches. Cardew left a lifetime trail of damage behind him, among family, friends and students. He was, as Harrod shows, hugely personally charismatic yet was selfish, self-absorbed and had the egotistical pleasured self-regard of a toddler. But at the end of the day, there is his pottery. An amalgam of historical influences (particularly in the early days Byzantine and Greek), of north Devon slipware, of Ghanaian shapes and Eastern brushstrokes, his work is never to be mistaken for that of any other potter. Cardew’s idiosyncrasies as a teacher, as well as the austerity of his vision, ensured that he could not be followed. His work has therefore often been elided in histories of the craft. It is good to be reminded in this fine biography precisely how good it really was.